Our Tae Kwon-Do curriculum teaches both the Chang Hon and the Kukkiwon Styles of Tae Kwon-Do, as we believe it is important to encompass all Taekwondo training, and not be limited by a particular style. 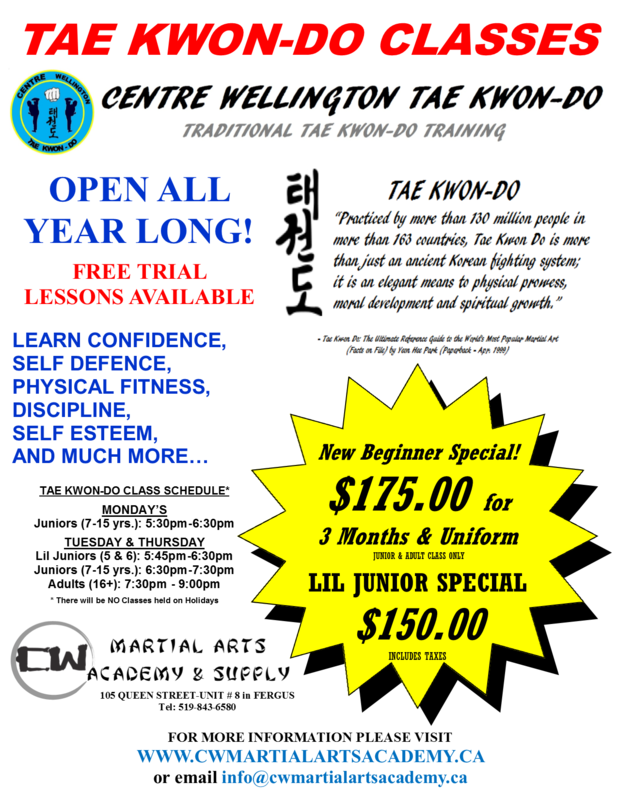 OUR TAE KWON-DO PROGRAMS ARE SEPARATED INTO 3 AGE GROUP! FOR KIDS AGED 5 – 7 YEARS OLD, WE HAVE OUR LIL JUNIOR PROGRAM (2 X WEEK). THESE CLASSES ARE 45 min. IN LENGTH AND ARE DESIGNED TO INTRODUCE KIDS TO TAE KWON-DO. THESE CLASSES WILL FOCUS ON BASIC TECHNIQUES & DISCIPLINE, WITH SOME FUN THROWN IN AS WELL. CLASSES ARE 1 HOUR IN LENGTH & ARE HELD 3 NIGHTS A WEEK! -FOUNDATION TECHNIQUES, PATTERN TRAINING, SELF DEFENCE, SPARRING, BREAKING, PHYSICAL CONDITIONING, DISCIPLINE AND MORE ! ADULT PROGRAM IS FOR THOSE 16 & OVER* AND CLASSES ARE 1 – 1.5 HOURS IN LENGTH & ARE HELD 2 NIGHTS/WEEK!